It's a docket-clearing episode! 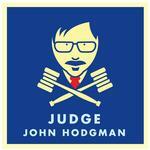 Judge Hodgman weighs in on loud popcorn eating, anniversaries, and fedoras, and selects the best drawings of his proposed Double-Ended Unicycle. The episode's evidence, which in this case means drawings of double-ended unicycles. And, for a limited time only, the unicycle T-shirt. Yes! I would like docket episodes more if they featured more followups with previous episodes.